Let’s say you want to eat well—nutritionally speaking—and you are willing to put in some quality time in the kitchen. (That’s Great!!!!) But you don’t feel you have enough time or know-how to make fresh, new, organic, whole-food meals every day. To top it off, summer’s coming and the kids will be out of school and you have a gazillion things you also would like to do. One way to handle that without feeling like you have to slave away in the kitchen in the heat of summer is to plan and make all-in-one-meals. That’s not a new idea, of course. But let’s make it into a new idea by creating some wonderful whole grain salad meals. These will have your whole grains, protein and vegetables all in one dish. Have you ever tried quinoa? I was first introduced to it about 30 years ago and at that time I had never heard of it. All of a sudden it appeared on the shelves and bulk bins of the natural food stores along with quinoa flour, bread and pastas. I took a close look at some that was cooked for me and was fascinated by the fact that each cooked grain of quinoa looked like a little planet with a ring around it–like Saturn. Far out! Quinoa is referred to as an ancient grain. Technically it is a seed but is considered a grain as far as its qualities and uses. Quinoa was a staple food for thousands of years in the Andes region of South America as one of just a few crops the ancient Incas cultivated at such high altitude. I suppose that’s why I’m attracted to eating it here in Albuquerque which is more than 5,000 feet above sea level. Quinoa Salad - An all-in-one meal! 2013 has been declared UN International Year of Quinoa and I’m all for it! 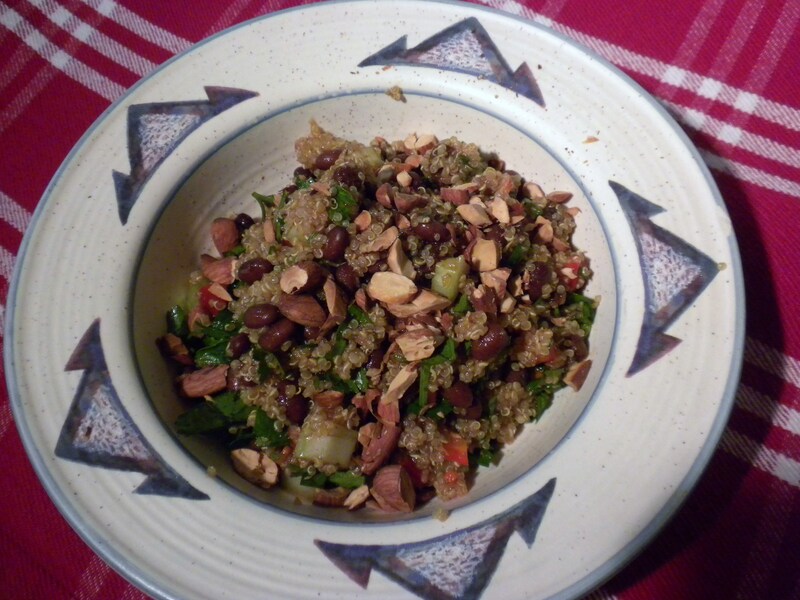 Here is a recipe I recently developed for a summer dinner salad using quinoa. 3 Tbls oil of your choice. I used toasted pumpkin seed oil but you could also you toasted sesame seed oil or olive oil. Wash the quinoa by placing it in a bowl and filling the bowl with cold water. Make sure the water has mixed with the quinoa by gently stirring and then pour off the excess water. Use a strainer to catch the small quinoa seeds so they don’t get wasted. Repeat the washing process. Bring the cup of quinoa and 2 cups of springwater plus a two-finger pinch of sea salt to a boil. Add the currants and the tumeric. Simmer or lightly boil for 10 to 15 minutes. If you live at a higher altitude like I do, you may have to simmer the quinoa a bit longer. While the quinoa is boiling, finely dice the peppers, celery and parsley. When the quinoa is done cooking (it is tender and there is no more water in the pan) then turn it out onto a plate to cool. When the quinoa is cool, mix in the red peppers, celery and parsley. Add the cooked black beans. Combine oil, vinegar, cinnamon, sea salt and barely malt. Adjust to your preferred taste. Pour the dressing over the quinoa mixture and mix it through. Add the roasted chopped almond slivers*. Garnish with thinly sliced scallions. * I roast almonds by taking organic raw almonds and rinsing them off in cold water and draining them. I spread them onto a baking pan and put that into the oven at 350 degrees until they start smelling aromatic and roasted and then take them out. Let the roasted almonds cool off a bit before chopping them up. Whole grain dinner salads can be made with infinite combinations of grains, vegetables, beans and other garnishes. I suggest using recipes until you get the hang of it and then just go for it! No limitations. This entry was posted in Cooking, Food, Lifestyle, Recipes and tagged Cook, Inca, Quinoa, summer dinner ideas, summer salad ideas, Whole grain, whole grain meals by mycookinglifebypatty. Bookmark the permalink. Hey there Patty! Wanted to let you know Big Sis and I have nominated you for the Sunshine Award. More details here: http://mysisterspantry.wordpress.com/2012/05/01/sunshine-day-indeed/. Have a super day! Wow and Thanks! I don’t know what that is but I’m headed right over there to find out! Great post! We like quinoa and like it soups a lot. Sometimes I serve it as a side or main dish with veggies in it and cook it in broth for a little extra flavor. My daughter loves it when I put pineapple and mandarin oranges in it. Love me some quinoa! And I happen to have a huge container of figs too, that need using…will give this a try – thanks! Figs would be great in this! Thanks for stopping by. I gotta tell ya – this salad tastes great!! Thank you for your unbiased opinion Hunny!